One can park a $50,000 car in the public right of way essentially for free, but, in some cities with scooter permit fees “…the vehicle causing no potholes is paying 20 times what that car pays,” explained Ryan Russo, head of Oakland’s Department of Transportation. Russo’s remarks were part of a SPUR panel discussion today on the future of scooters, regulations, and our streets. That double standard was a theme that Russo, and the other panelists, share in common: that complaints about scooters are getting a significant amount of press and attention because they are new, while the costs of automobiles is ignored. Before the freeway building age, streets were shared equally by bicycles, pedestrians and, in the case of Jack London Square, trains, produce vendors and forklifts. In a way, there was a sort of disarray that kept cars driving slowly and cautiously instead of zooming down streets at unsafe speeds. Jack London, because of its wholesale produce markets and the train line that remains, still has some of that chaos and charm. “My goal is to maintain chaos in the street, with a belief that it’s the safest street for us all,” said Hauser. That all sounds good, but what about the downsides? There are illegally parked scooters and there’s scooter riding on the sidewalk. Plus Uber and Lyft were billed as ways to reduce private vehicle ownership and thereby the space taken up by cars–instead most research now shows they’ve made traffic even worse. Couldn’t scooters cause similar problems perhaps by making sidewalks feel unsafe or drawing too many people from public transportation? That’s because trip data in the form of heat maps, number of rides, etc., is readily available from scooter companies, so officials can now see how and where they’re used. Plus car-based “sharing,” such as Uber and Lyft, are regulated by the state. Scooters are regulated by cities, which can then influence how they’re deployed. In addition, it’s easier for a city to punish a misbehaving scooter company, since they can be scooped up and impounded much more easily. That also punishes the company, rather than the owner of the car as in the case of Uber and Lyft. Knowing how scooters are being used, and creating shared parking spaces and bike lanes on those routes to accommodate them, is the key. 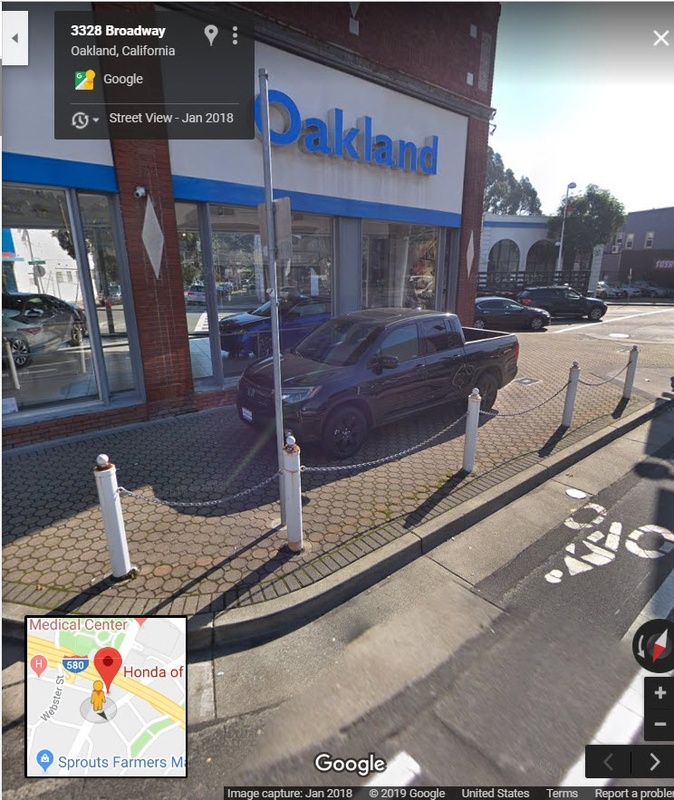 “We want to lower transportation costs for Oaklanders–we want them to have more choices and not be stuck with a homogeneous [car-based] transportation system, with congestion and pollution,” said Russo. San Francisco first banned (and still heavily restricts) scooter companies while they figured out a permitting system. Oakland decided on a chiller approach. By working with Lime and Bird, he said they’ve already gotten some changes to scooter operations. For example, Oakland asked scooter companies to avoid having them stacked up on the newly refurbished Latham Square. They’ve also reduced “young person riding, two person riding–we’ve already seen improvements and our regulations aren’t even in effect yet,” said Russo. He is also hopeful by keeping track of where scooters are going, they can build momentum for more protected bike lanes. “We need to clarify where scooters can and can’t be…. and we should re-double our efforts to improve our streets for micro-mobility, the foundation of which is the bicycle,” he said. Can we stop with the “cars get away with a lot so why can’t we” attitude? From a pedestrian perspective, scooters need to be regulated. Bicycles need to be regulated. And definitely, cars need to be regulated. But scooters are more of a nuisance and menace to pedestrians because they are ridden on sidewalks and strewn on sidewalks. I believe that they should be included in comprehensive transit planning processes, and, sadly, our approach seems to be piecemeal. Should they be limited to bicycle lanes? Should they be allowed in traffic lanes? I think so, but I think experts need to answer those questions. If this has been decided, it isn’t at all detectable from the scooter riders I see. It is mostly a free for all, people riding everywhere, sometimes with little concern for the safety of themselves and those nearby. In my opinion, they should have dedicated on-street parking (meaning that yes, we cannibalize car parking for them), be prohibited from being ridden or parked on sidewalks, and they must be ecologically sound, such as mandated battery recycling processes, and the appropriate fees paid for recycling of the batteries. By what metric? I’m all for sensible regulation of scooters to protect pedestrians, but saying that they are *more* of a menace than cars when cars regularly kill pedestrians in SF and scooters have killed… let me check my notes… none is a bit much. It’s possible to be in favor of regulation without hyperbolic claims like that. If this has been decided, it isn’t at all detectable from the scooter riders I see. It is mostly a free for all, people riding everywhere, sometimes with little concern for the safety of themselves and those nearby. That’s not a problem with the regulations, but with people’s behavior, awareness, and/or enforcement. You could say the same thing about drivers yielding to pedestrians at crosswalks (marked and unmarked) or following speed limits, or cyclists stopping at red lights. It’s not that the law is unclear, people just aren’t consistently following those laws. Ridgeline truck has been on display at Oakland Honda for over a year. And you’re just now noticing it? It’s not my neighborhood, I just happened to be here when I read that idiotic comment. That is bonkers that they have been parking a truck on the sidewalk for years. By what metric? I’m all for sensible regulation of scooters to protect pedestrians, but saying that they are more of a menace than cars when cars regularly kill pedestrians in SF and scooters have killed… let me check my notes… none is a bit much. They have. See CVC 21235. 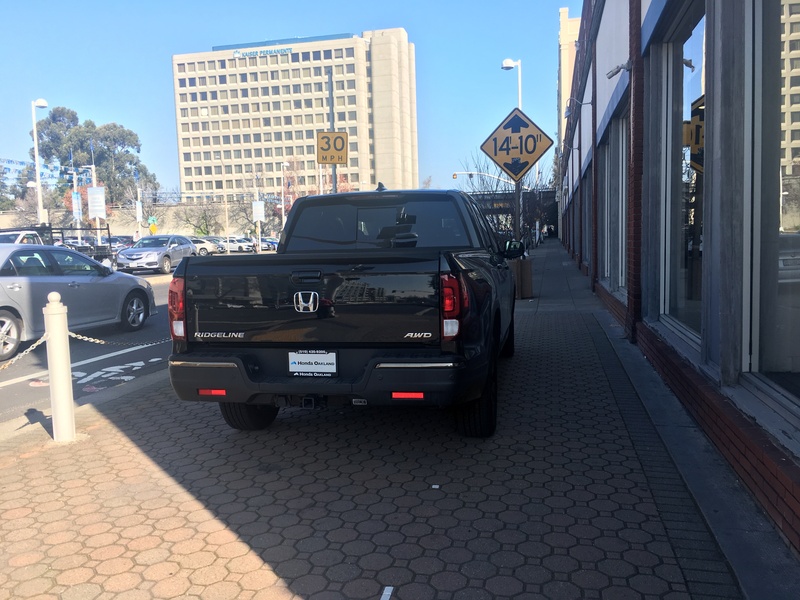 No double standard – eliminate all vehicles from sidewalks. And that is the problem There are too many people (I know, not all) in San Francisco in cars,on bicycles, scooters, motor cycles or on foot who are thoughtless and arrogant, and endanger the lives of themselves and others, and, if there continues to be lax enforcement, we need to develop other transit plans. For example, if we cannot ban cars from the urban core, I think dedicating every third street to public transit, bicyclists, pedestrians and scooters and prohibiting cars on those dedicated streets is a good idea. That would relieve the pressure for those of us who don’t drive and just maybe we could learn to behave an respect each other.